Pink Floyd frontman David Gilmour will put out his first solo album in nine years later this year. Although he revealed no other details about the as-yet-untitled LP on his website, he has scheduled a number of tour dates in the U.K. and Europe for this September that will coincide with the LP, suggesting a fall release. Gilmour will kick things off with a three-night engagement at London's Royal Albert Hall, beginning September 23rd. Last October, Gilmour told Rolling Stone the record was, at that point, still coming together. "It's coming along very well," he said. "There are some sketches that aren't finished, and some of them will be started again. There's a few months' work in it yet. I'm hoping to get it out this following year. Then I'm hoping to do an old man's tour, not a 200-date sort of thing." The new record follows up Gilmour's 2006 solo outing, On an Island, as well as Pink Floyd's farewell album, The Endless River, which came out last year. That record was mostly instrumental and contained songs that he and drummer Nick Mason had worked on from their Division Bell sessions so as to include the contributions of late keyboardist Rick Wright. "I think we have successfully commandeered the best of what there is [and] I suspect that it is," Gilmour said of that release in a BBC 6 interview at the time. "It's a shame, but this is the end." 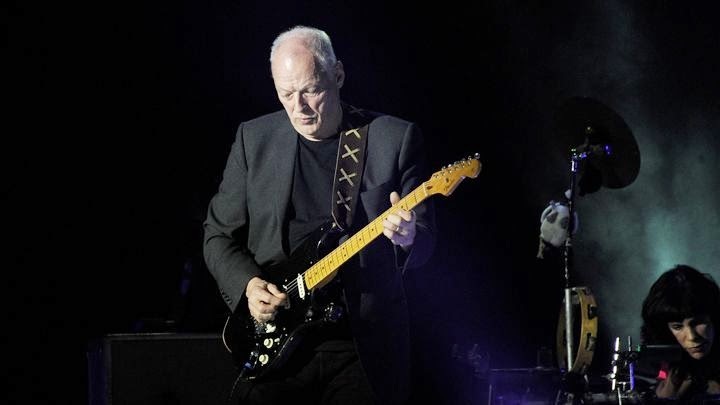 Gilmour's most recent live appearance was at a Bombay Bicycle Club gig at Earls Court last December, where he played Pink Floyd's "Wish You Were Here" with the group. He also played that band's "Rinse Me Down" with them.